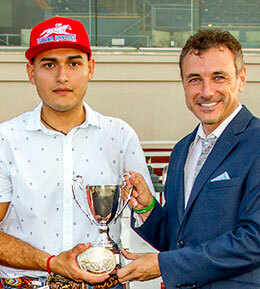 Fair Grounds Race Course officials presented Jose Luis Sanchez, III with his first Quarter Horse training title in the "Big Easy" on Saturday. NEW ORLEANS, LA—SEPTEMBER 10, 2018—Trainer Jose Luis Sanchez III, a native Laredo, Texas, earned his first Fair Grounds training title, while veteran jockey John Hamilton garnered another riding title and Rogelio Marquez, Jr. and Jose Ortiz were tied for the leading owners at the just concluded Fair Grounds Race Course Quarter Horse meet in New Orleans. Sanchez, who also trained the winner of Saturday's $434,538 LQHBA Sale Futurity(RG1), compiled an (21) 8-1-4 record and his stable banked $337,129 at the Fair Grounds. 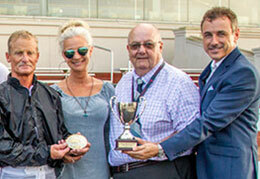 Trainers Barbara Alcantara and Kenneth Weeks were tied for second with six wins each. Hamilton took the leading jockey honors by riding 12 wins from 71 mounts with earnings of $187,305, a 17% win clip. The leading jockey was also honored by track officials for riding his 2000th Quarter Horse winner during the summer meet at Delta Downs. Luis Vivanco had 11 wins while Damian Martinez, Luciano Duenez and Rolando Cabrera had eight wins apiece to tie for third. Also on Saturday (Sep 8) at the Fair Grounds, Hamilton was feted by members of the jockey colony, horsemen, his wife, Sharon, and several of his grandchildren for a belated celebration of the milestone. Hamilton was emotional as he thanked a host of people for their support. "It’s so amazing to be surrounded by so many people," said Hamilton. "My success is owed to God, my owners, trainers, grooms, gate crew and my wife who has put up with so much! I will continue to ride and hope to win as many races as possible!" Rogelio Marquez, Jr. and Jose Ortiz are the owners of four winners apiece to tie for the Fair Grounds Leading Quarter Horse owner of 2018. Marquez picked up four wins from 11 starts with earnings of $76,053, a 36% win clip. Ortiz had four wins from nine starts, a 44% win percentage with earnings of $53,440. Rancho Herradura LLC, Pete Scarmardo, McGehee Horse and Cattle Co LLC Jose Barron and Joe M. Davis each tied for second with three wins each.